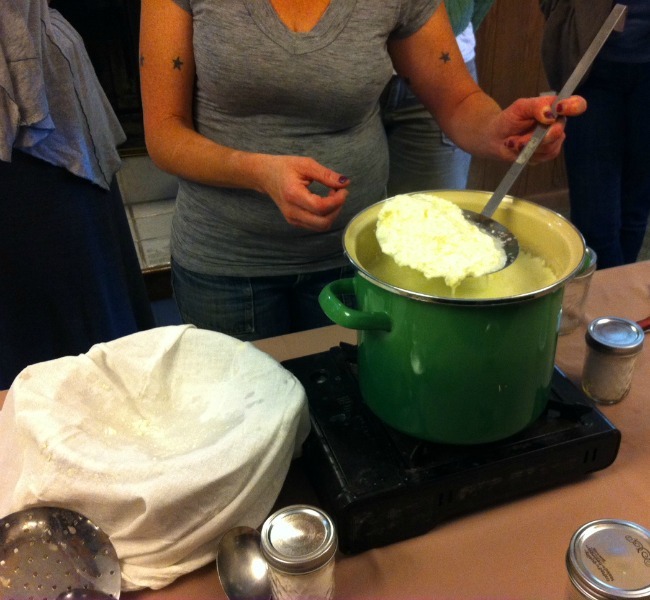 My girlfriends and I traveled an hour north of the Bay Area to Sonoma, in the Napa Valley, to take a cheese-making class from Sheana Davis last weekend. Sheana is an epicurean cheese-maker and provides cheeses to the French Laundry and other five-star restaurants in the area. Sheana travels around the country, learning to make different cheeses from women in their 70’s and 80’s, who have been making cheese all their lives, and who have a vast amount of information to share. She is hoping to capture this information so it is not lost when these talented women are no longer with us. 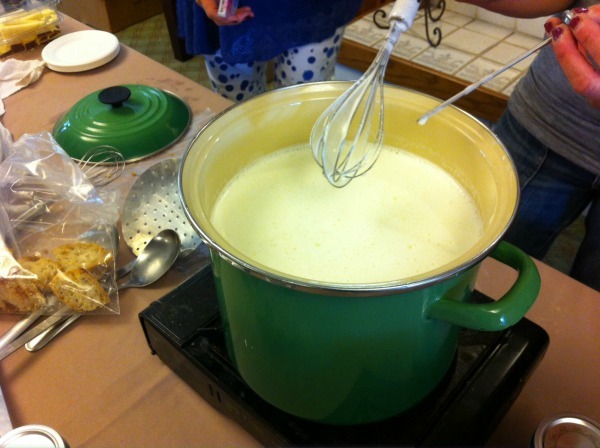 Sheana first perfected this recipe for Creme de Ricotta to teach mothers who were using WIC (Women/Infants/Children Food Assistance) or Food Stamps how to take milk and a little cream and turn it into a tasty cheese, which could then be used to make nutritious meals for their families. Processed cheeses are very expensive and usually out of the reach of those families with limited budgets, so this is an excellent alternative. 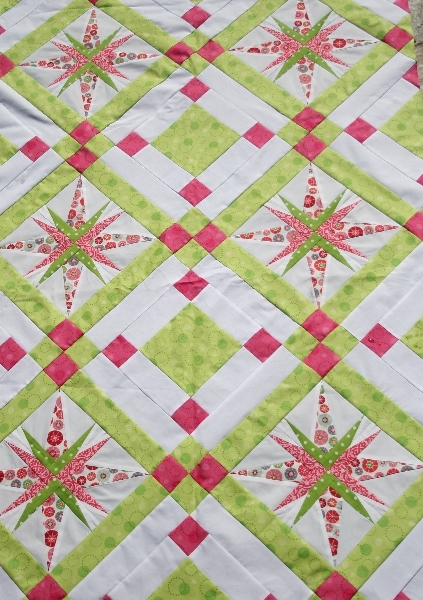 You will also need a heavy pan (do NOT use a non-stick teflon pan because the teflon causes a chemical reaction which will not allow the cheese to form correctly), a 36 inch square of 200 thread count muslin or cotton (cheesecloth), a slotted spoon or ladle, a colander sitting in a deep bowl, and an all-purpose cooking thermometer. 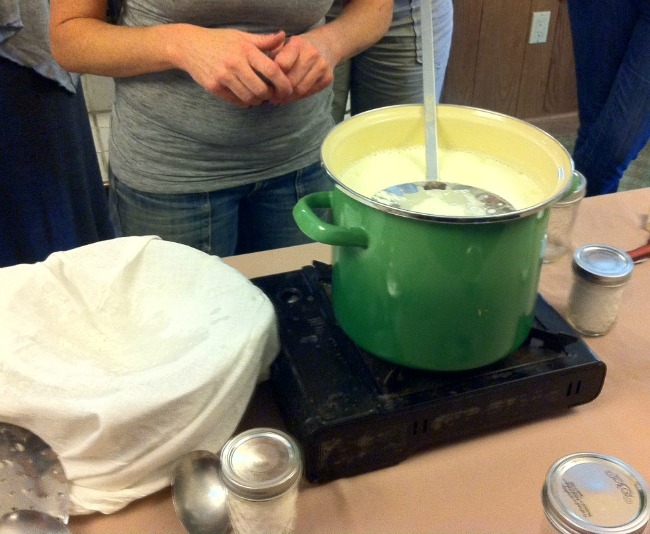 Heat the milk and cream over medium heat to 200 degrees F. This will take approximately 20 minutes. Stir or whisk often to prevent scorching on the bottom of the pan. When the mixture reaches 200 degrees, stir the milk clockwise, and quickly pour the vinegar in and sprinkle with the salt. The milk will start to coagulate immediately. White curds will start floating in the whey. As you can see here, it immediately thickened enough to hold up the weight of this large cheese ladle. Cover the pot and allow to rest for 10 – 12 minutes (but no longer, or the cheese will thicken too much). Do not remove the lid from the pot during this resting time. 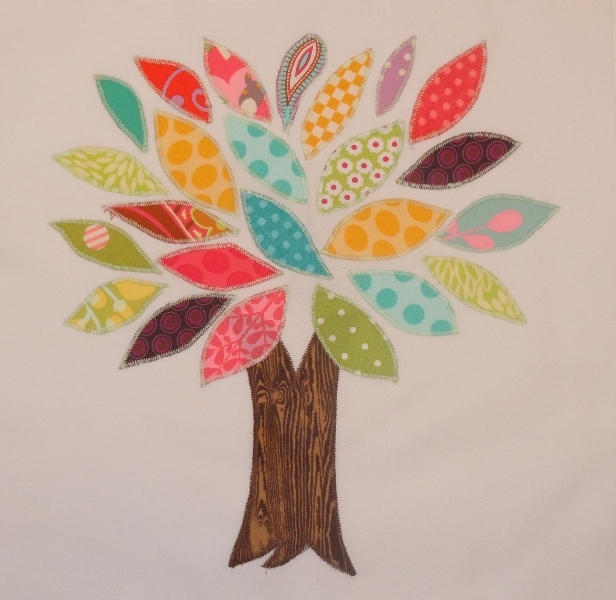 Line a colander with cheesecloth, or a 200-count cotton cloth. 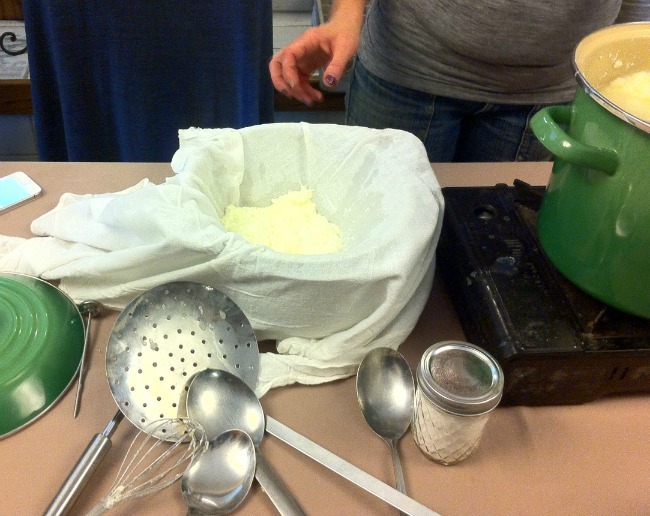 Gently ladle the curds into the cloth. When spooning the curds into the colander, gently place the spoon against the side and let the curds slowly slide onto the cloth to drain. 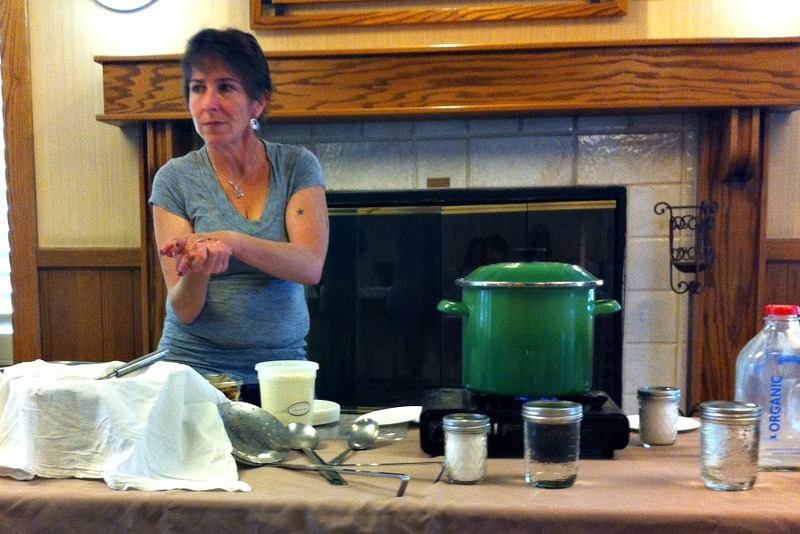 The more gently you handle the curds, the better the finished cheese. Each time you spoon more cheese into the colander, put it in a different area so you are not spooning curds and whey directly over the last curds placed in the colander. 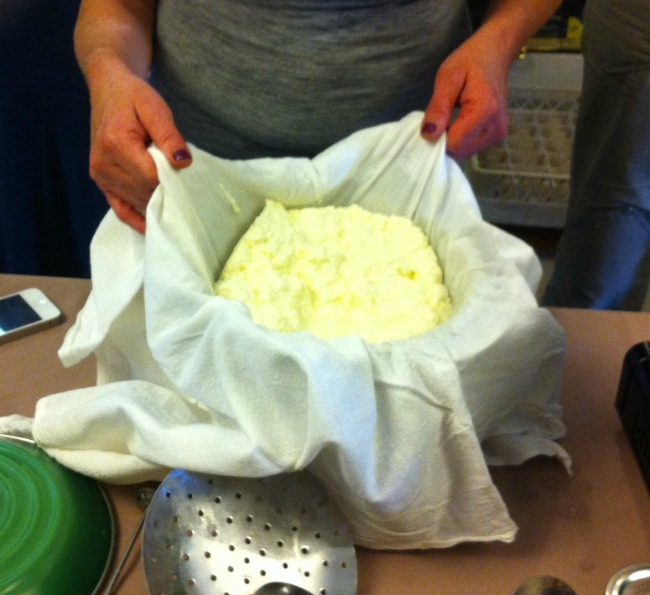 You can let the curds drain for up to 30 minutes, but the longer it sits the more firm the cheese will be. 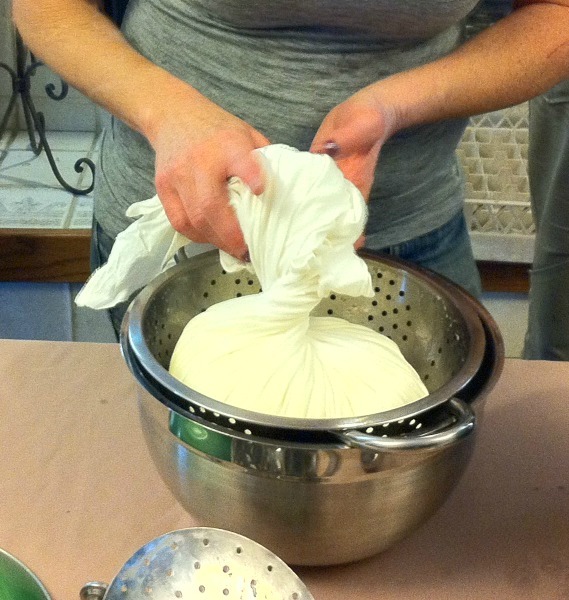 For a light, fluffy ricotta, gently pull up on the sides of the cloth, allowing the liquid to drain through the colander. Work around the perimeter of the bowl, very gently lifting and lowering the cheese while it drains. When the majority of the liquid has drained from the cheese, carefully twist the ends of the cloth, gently squeezing the cheese. This will mold the cheese into a rounded shape, which can be turned over and placed on a plate for serving. Twisting the cloth around the cheese too vigorously will condense the cheese curds, making the cheese much firmer and less fluffy. This cheese can be served sweet or savory. For a sweet appetizer, drizzle honey over the top of the cheese, then scatter chopped nuts and dried cranberries over the top of the honey. For a savory option, top the cheese with a layer of pesto and pine nuts. Or layer the pesto over the curds when you are ladling the curds into the colander. The pesto will be compressed as a layer in the cheese while it is being formed. Served while it is still warm with slices of baguette or crackers. This would be a delicious and super-easy appetizer for your next party. This morning I had this cheese with honey and cooked cranberries gently folded in, on a toasted bagel. Heaven! I can hardly wait to see what this ricotta tastes like in a lasagna.